Cooped Up is now available to play on your browser! You are the latest addition in the exotic bird sanctuary. The other older birds have been Cooped Up a little too long and are a branch short of a perch! 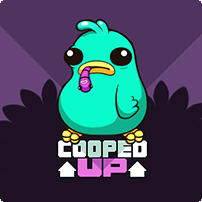 Click To Play Cooped Up! 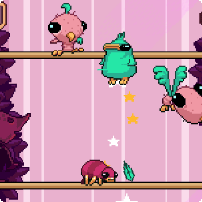 We are currently working on a WebGL solution to bring the Nitrome. For the meantime, Chrome users can manually install Unity WebPlayer or use another browser like Firefox. Play Drop Wizard, an amazing game brought to you by Neutronized! We love the adorable character design, environments and great gameplay mechanic in this one! As with all of the Neutronized games, this one has got wonderful art direction and sound design. We really enjoyed the boss fights! We hope you have fun everyone, more Pixel Love next week! Green Ninja is now available for iOS�and Android�for free! Check out the trailer, above to get an idea of what is in our latest game! Today's Pixel Love game is Pixel Escape! This game asks you to steer the tiny pixels away from the fast approaching wall of data corruption, using your super fast reflexes and drawing skills to guide them to safety! 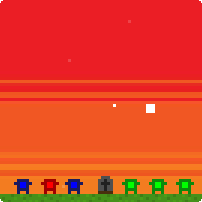 Along the way, you can pick up some of your fellow pixel folk and help them out of the jam too. 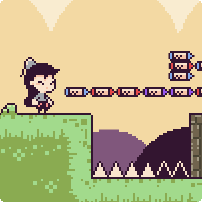 This game has a cool "corrupted pixel" palette, similar to that found in Underbyte. Click to Play Pixel Escape! Enjoy everyone, we'll pick another stand out game to highlight as next week's Pixel Love game! Until then I thought I'd show you one of the early levels. Green ninja shows the ninjas who's boss by slamming barrels into their faces. Did we mention apart from ninjas you could kick other stuff around, like blocks, barrels and erm... melons!?! More info on our upcoming action puzzler early next week. It's been a while in the making but our super fun Kung Fu action puzzler has been submitted to the stores ready for review. We realise that we haven't actually shown off any game play footage yet, so take a sneak peek at the title intro for now. We'll have more on this game over the coming days and might even show off a couple of stages for those of you who enjoy spoilers. Anyway Green ninja: year of the frogs release should be kicking off very soon (perhaps as early as next week if store approval moves quickly). We'll be bringing you more info on this as soon as we know. 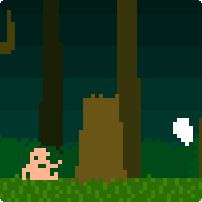 Today's Pixel Love game is Potatoman Seeks the Troof by PixelJAM! We have had a lot of fun playing this one! The ultra retro graphics are a staple of the pixelJAM team as is the wonderful sound design. Help guide potatoman on his quest for the troof! Things aren't as they seem in this one. Get the full game on iOS! Get the full game on Steam! Have Fun Nitromians, we'll bring you another pixel love game next week! Platform Panic (browser version) has got the latest update! 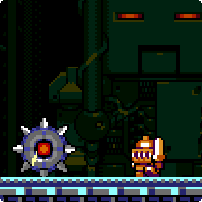 There are now lots of new traps and elements: lasers, warp pipes, a new robot enemy, crusher blocks, spike balls! There are also twice as many rooms, with a new theme and background. 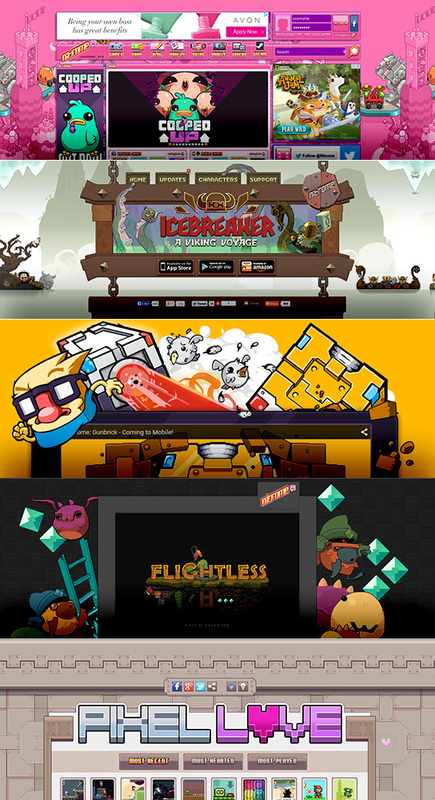 We are in need of a well-rounded, hard-working, enthusiastic website developer to join the Nitrome team and take over the reigns of some high profile websites and web services including the nitrome.com website! We are looking for a highly motivated, creative individual with lots of skills that wants millions to see what he / she can do! We need someone to manage / maintain / develop our website and mobile integration. 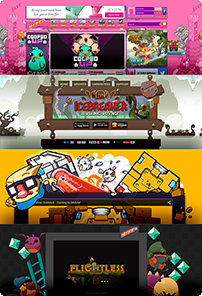 Challenges within the role are varied from creating tools for our market leading games to controlling all areas within the Nitrome website. Tools and services? - Think high scores, achievement systems, multiplayer networking and cross promotion stuff! Website duties range from front end to back end, all the way to configuring the servers and hosting. You’ll be working along side game programers and artists, creating solutions for all our online “pie in the sky” ideas. You will have the opportunity to steer your own role and develop in areas of your own interest, so you can develop new awesome skills. This all comes with a high level of responsibility so someone who can be focused and organised is essential. Experience is not as important as demonstrating your ability. Salary is negotiable. This is a job for someone with a huge passion for the industry that wants to be rewarded for going the extra mile. Please send your CV and salary expectations to jobs@nitrome.com if this is something that you are excited about! 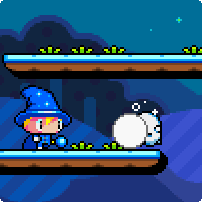 Today marks the second major update for Magic Touch: Wizard for Hire! The game has to date had over 5 million downloads which has blown us away! To cellebrate this update for the first time lets users unlock new Wizards... well actually wizards, witches, warlocks, magicians and genies... so lets say magic folk! There are 10 in total to unlock so it should take a little while for you to get all of them! Play Fathom, an awesome platformer created by Joe Williamson. Apologies first and foremost for not getting a Pixel Love game featured yesterday, I accidentally set up the date as Tuesday (being today). We had a bank holiday Monday it I got slightly confused! This game is a real gem. The overall feel of this one is exceptionally crafted! 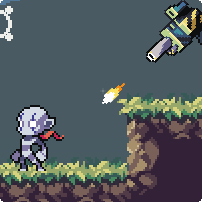 Explore the environment whilst controlling bullets to evade getting hit! The music is also something to admire. It fits seamlessly with the game's universe and aesthetic adding to the immersive fabric of Fathom. Well, we hope that you all enjoy playing this one Nitromians! We'll bring you more Pixel Love next week, (preferably on the Monday!). Todays Pixel Love game is Iridescent! The game takes you on an adventure to find a mystical flower with multi-coloured petals. This flower is a cure that can help revive your friend! 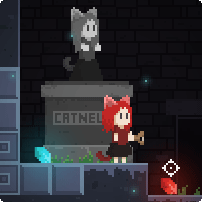 The art style reminded us a little bit of our game Ditto. The music is very atmospheric, we really got immersed in this one. The game play will find you solving puzzles using a unique crystal mechanic. There are different coloured crystals that have different effects when "blessed"
We hope you enjoy this one, we'll bring another pixel love title to your attention next week! Platform Panic update #2 is out now on App Store and Google Play! So what can you expect to see this time? We've doubled the number of rooms and filled them with new traps for your own enjoyment: lasers, spike balls, crucher blocks and more... and the very last model of our robot enemy now more aggressive and intelligent! On the cosmetic side of things, Helm gave these rooms a new background, a jungle theme crossed with various elements from classic games! Finally, the game now keeps track of the rooms that you have completed, and if you're up for the challenge, you can try to complete as many room layouts as possible and be rewarded by a new set of achievements! We really appreciate your continued interest in Platform Panic, enjoy the update and thanks for playing! Play this very stylish platformer Crayon Poke (from the creator of Nitrome Jam Game "A Kitty Dream"). Use crayons to scale hard to reach places! This game was created in 72 hours LudumDare 32. This version has been cleaned up and polished since then including bug fixes. We really like seeing the things Rayumi makes, as the art style is always executed very well. Click To Play Crayon Poke! Have fun Nitromians, more Pixel Love coming next week!